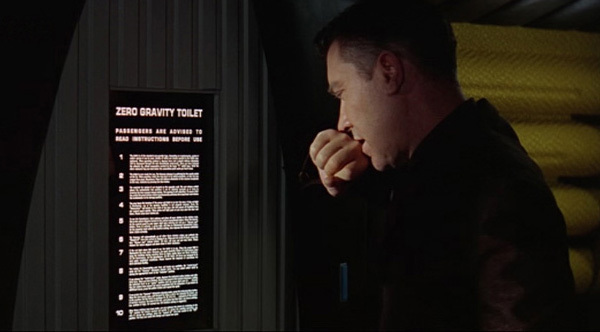 The toilet is of the standard zero-gravity type. Depending on requirements, System A and/or System B can be used, details of which are clearly marked in the toilet compartment. When operating System A, depress lever and a plastic dalkron eliminator will be dispensed through the slot immediately underneath. When you have fastened the adhesive lip, attach connection marked by the large "X" outlet hose. Twist the silver coloured ring one inch below the connection point until you feel it lock. The toilet is now ready for use. The Sonovac cleanser is activated by the small switch on the lip. When securing, twist the ring back to its initial-condition, so that the two orange lines meet. Disconnect. Place the dalkron eliminator in the vacuum receptacle to the rear. Activate by pressing the blue button. You may leave the lavatory if the green exit light is on over the door. If the red light is illuminated, one of the lavatory facilities is not properly secured. Press the "Stewardess" call button on the right of the door. She will secure all facilities from her control panel outside. When green exit light goes on you may open the door and leave. Please close the door behind you. To use the Sonoshower, first undress and place all your clothes in the clothes rack. Put on the velcro slippers located in the cabinet immediately below. Enter the shower. On the control panel to your upper right upon entering you will see a "Shower seal" button. Press to activate. A green light will then be illuminated immediately below. On the intensity knob select the desired setting. Now depress the Sonovac activation lever. Bathe normally. The Sonovac will automatically go off after three minutes unless you activate the "Manual off" over-ride switch by flipping it up. When you are ready to leave, press the blue "Shower seal" release button. The door will open and you may leave. Please remove the velcro slippers and place them in their container. If the red light above this panel is on, the toilet is in use. When the green light is illuminated you may enter. However, you must carefully follow all instructions when using the facilities during coasting (Zero G) flight. Inside there are three facilities: (1) the Sonowasher, (2) the Sonoshower, (3) the toilet. All three are designed to be used under weightless conditions. Please observe the sequence of operations for each individual facility. Two modes for Sonowashing your face and hands are available, the "moist-towel" mode and the "Sonovac" ultrasonic cleaner mode. You may select either mode by moving the appropriate lever to the "Activate" position. If you choose the "moist-towel" mode, depress the indicated yellow button and withdraw item. When you have finished, discard the towel in the vacuum dispenser, holding the indicated lever in the "active" position until the green light goes on... showing that the rollers have passed the towel completely into the dispenser. If you desire an additional towel, press the yellow button and repeat the cycle. If you prefer the "Sonovac" ultrasonic cleaning mode, press the indicated blue button. When the twin panels open, pull forward by rings A & B. For cleaning the hands, use in this position. Set the timer to positions 10, 20, 30 or 40... indicative of the number of seconds required. The knob to the left, just below the blue light, has three settings, low, medium or high. For normal use, the medium setting is suggested. After these settings have been made, you can activate the device by switching to the "ON" position the clearly marked red switch. If during the washing operation, you wish to change the settings, place the "manual off" over-ride switch in the "OFF" position. you may now make the change and repeat the zero gravity Cycle.